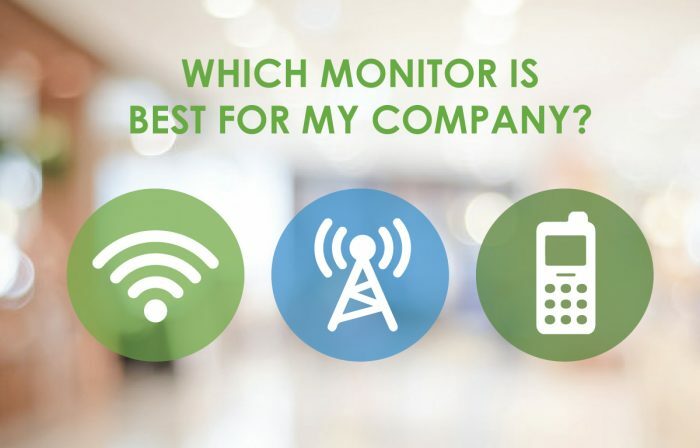 Wi-Fi, Cellular or RF: Which Type of Monitor is Best for Your Company? Wi-Fi, Cellular or RF: Which Type of Monitor is Best for Your Company? While saying “yes” to tank monitors is becoming easier, however the question that arises shortly after the decision to purchase tank monitors is to what type of monitors you need for your customer base. Your customers are comprised of all types of accounts ranging from ‘typical’ homes to large properties with remote tanks, indoor tanks, and outdoor tanks, etc. To help guide you through the decision-making process of “what type of monitor do I need?”, here’s a summary of the tank monitor communication options available to fuel marketers in 2018. How it communicates – Wi-Fi tank monitors use local highspeed internet to wirelessly send the tank readings to the tank monitor provider, eliminating the need for a physical wired connection. Benefits – Wi-Fi tank monitors generally cost less because they use the customer’s existing internet router to transmit the data, so this form of communication does not typically include any additional communication costs. Wi-Fi tank monitors are simple to install and are generally used for heating oil tanks. Things to consider – Since you will be using the customer’s Wi-Fi, you would need to obtain their Wi-Fi credentials to connect the tank monitor. If the Wi-Fi password, router or internet provider change, that will almost certainly cause the communication to stop, until the credentials and connection are updated. Wi-Fi is somewhat prone to potential interference from objects in the home (phones, microwave ovens, metal walls, etc.). Summary – If you have accounts with an internet connection, indoor heating oil tanks and are looking for an inexpensive tank monitoring solution, this is a great option. How it communicates – Cellular tank monitors use a cellular carrier (such as AT&T, T-Mobile, Sprint or Verizon) to transmit the tank readings to the tank monitor provider. There are 2 primary types of cellular devices (1) Third Generation (3G) and (2) Fourth Generation (4g, LTE, Cat-M…it has many variations). Benefits – Cellular tank monitors can be used for heating oil or propane tanks and can be used with indoor or outdoor tanks. They have 95-99% reading reliability and work completely independent of the customers internet, so you don’t need to get their Wi-Fi credentials. Things to consider – As cellular communication is not free, this will likely add to your monitoring costs (monthly fees are most typically seen). Depending on the carrier affiliated with the tank monitor, you need to consider cell coverage in the area in which you are planning to install monitors. No coverage equals no connection. Summary – If you have multi-fuel accounts or a mixed fuel customer base and can afford the slightly higher price tag, cellular is a great option with less ‘hassle’. With solid cell coverage, these units will work for accounts without internet access. -. How it communicates – Similar to Wi-Fi, RF tank monitors use the internet to transmit the tank readings, but also requires a router (likely included with your tank monitor) to transmit the data. Benefits – RF monitors can be used for indoor or outdoor tanks. This type of connection easily passes through obstructions and provides approximately ¼ mile of communication range, meaning that the monitor can be further away from the communication tower and still detect a reading. Similar to cellular, you will NOT need the customer’s Wi-Fi credentials. Things to consider – This is the only tank monitor solution that requires 2 pieces to connect and while you don’t need the customer’s credentials, you will still need an internet connection. The installation on these monitors is usually more cumbersome, depending on where the tank is located. Summary – If you like the idea of cellular monitors but you have accounts that are outside the coverage area, RF monitors are a great alternative and they are likely less expensive than cellular monitors. Hopefully this gives you a better understanding of the monitoring devices available today so that you can decide what the best mix is for your company. If you have any additional questions, let us know and a GREMLIN team member would be happy to help.